It took nine rounds across two close and exciting bouts before Joshua “The Passion” Pacio finally figured out Yosuke “The Ninja” Saruta. And with the way Pacio ended things, the long wait was certainly worth it for the Filipino superstar. Pacio scored a devastating knockout win last Friday, 12 April at ONE: ROOTS OF HONOR to reclaim the ONE Strawweight World Title from Saruta in front of thousands of Filipinos at the Mall of Asia Arena. Knowing the challenge that Saruta brought to the table, Pacio is grateful to finally move past this chapter in his career. “This is by far the most challenging match I have ever been into,” said Pacio. 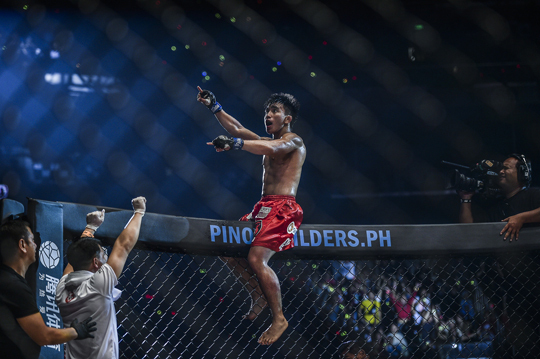 It was the perfect bounce back for the Filipino phenom after the Saruta narrowly defeated him via split decision at ONE: ETERNAL GLORY in Jakarta, Indonesia last January. Instead of being at the mercy of the judges' decision, this time around Pacio took it completely out of their hands with a scintillating finish. "The Passion" delivered a perfectly executed head kick in the fourth round, slumping Saruta on the canvas which prompted the referee to intervene and stop the match. After looking reluctant and passive in their initial meeting, the 23-year-old Pacio looked as dangerous as ever and he gives Saruta credit for pushing him to the limit. “It doesn’t matter how long you train, what I’ve learned from the first fight is that if you hesitate, all those preparations will go to waste,” said Pacio. At the end of the day, Pacio is just grateful for the chance to vindicate himself in his home country. The Baguio City native also credited the fans for cheering him on, even through some scary moments early in the contest. “They bring a different kind of energy, it gives me courage to hear them and to be honest, I don’t feel tired,” said Pacio.